After a day of draws in round 11 of the Candidates, we enter round 12 with the following pairings: Anand-Andreikin, Mamedyarov-Karjakin, Topalov-Svidler and Aronian-Kramnik. There is one final rest day after this round. @NastiaKarlovich: “4 draws today.Calm before the storm?All excitement started at 12th round in London.Looking forward to see what will happen”. In round 12, Carlsen lost with black against Ivanchuk and Kramnik won with black against…Aronian! We see the same pairing in round 12 this year. Just read the cover of the latest New in Chess Magazine with Aronian and this quote: “I’m a hippie now, carefree and relaxed”. Maybe it has something to do with the shirts he’s wearing? Talking about NIC: “The more space is given to Anish Giri in NIC, the more it tends to look like a teenage magazine or an adolescent’s personal blog. #maturity“according to @OlimpiuUrcan. Not everybody agrees: @pookita: “Bah! I love his writing. He’s so personable. Something the chess world could use more of”. Better take a look at the boards in KM then! @NastiaKarlovich:“The games became so crazy! The storm has started on the boards!” The most tweeters focussed on Andreikin-Anand: @reachvsara: “Andreikin doing a Magnus, but Vishy NOT doing a Vishy! 16.c4 n Game on. Was Vishy REALLY expctd to duck again!? #Puzzling“. Andreikin doing a Magnus? Martin Bennedik knows more @bennedik: “Anand-Andreikin is following Anand-Carlsen game 2 from their match. With 15.Qf3 Anand deviates from 15.Ne4”. You can see by the tone of the tweets, mostly from India, that Anand had a good position. But a lot of respect is coming from other countries as well: Netherlands – @anishgiri:“Anand, it’s too much!! 😀 #theoldking #playingtoowell“. …and from the UK- @telegraphchess aka Malcolm Pein tweets: “Anand looking very good as Danny the d Pawn charges down the board the last 2 rounds might be a procession.” .…and also from Norway: “Fantastic performance from Anand – and he even had potential for more against Karjakin and Svidler!” tweets Jon Ludvig Hammer @gmjlh. @peterdoggers: “Guess @MagnusCarlsen is both hoping for & worried that @vishy64theking will be playing at this level in their next match. @BalaajiM: Magnus Carlsen will learn later this year “Baap Baap hota hai, aur beta beta”. 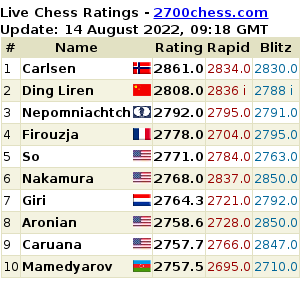 So, Anand is winning then? No! While the twitter community was watching Anand-Andreikin and the computers showed a comfortable plus for white (between +2 and +3) the game suddenly ended: @Aru-Amit again:” I don’t mind if Anand will draw now, but 874874832923 people will feel bad , they were watching this game only”. Jonathan Tisdall had a clear message for armchair grandmasters like Fossdall and Balu: “I bet Vishy would have played on if he had his engine running next to him at the board too”. Hey, using a computer next to the board would have been much easier, Vishy! The picture was taken by your blogger during his training camp in Bad Soden last year. Let’s go to the other games! Unfortunately, there were not many tweets about the other games, since the chess tweeters concentrated on the most important game of the round: @MarkTWIC: “Topalov 1-0 Svidler, opening went bad for Svidler and eventually lost. Aronian draw Kramnik. Kramnik was close to winning”. In Mamedyarov-Karjakin, an entertaining game developed, which actually deserved more attention in Twitterland: @Chess_Anyone: “Mamedyarov won’t probably win the Candidates, but one must admit he has fun in every each game he plays. It’s nice watching.” And it was a very important game for Karjakin after the sudden draw in the Anand game. Tisdall again: @GMjtis: “What I find most amusing is that Karjakin still has a chance to win the event”. @pogonina: “Karjakin had to make 6 moves in 14 seconds to reach the time control (no increments, remember!)” . A Candidate for the future: Fabiano Caruana. After the games, GM Fabiano Caruana commented the games of round 12: @fabianocaruana: “What a strange day in Khanty…Looks like Anand will be playing Carlsen again for the WC, but anything can happen these last 2 rounds”. One final tweet for today: @cafman11, Peter Cafolla: “No matter what your age Bishops can only,move diagonally and Rooks horizontally, so age should not be such an issue”.